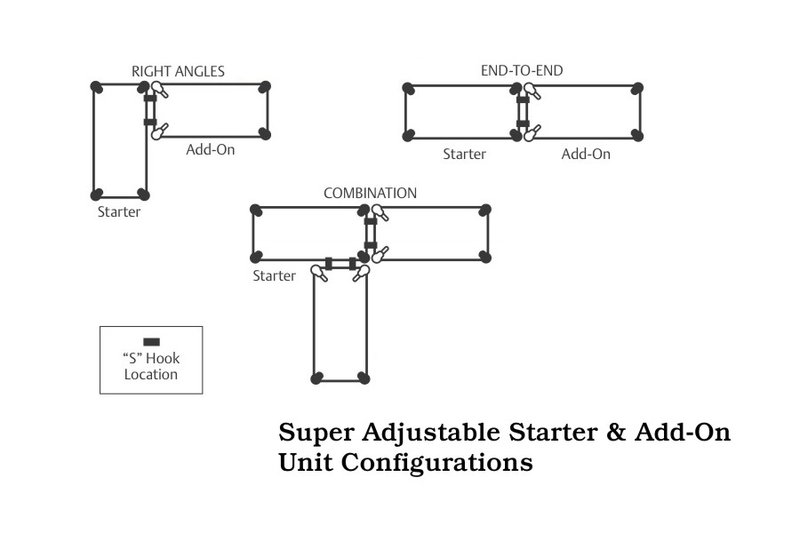 Metro Super Adjustable™ Starter and Add-On units save time and money by eliminating adjacent posts and replacing them with "S" hooks. This system offers a convenient way to create long runs of shelving, shelving at right angles and combinations of runs and right angles. Begin each run with a starter unit and attach as many add-on units as required. Starter units include (4) 74" (1880mm) posts and (5) 18" (457mm) deep Super Adjustable shelves. Add-On Units include (2) 74" (1880mm) posts, (5) 18" (457mm) deep Super Adjustable shelves and (10) "S" hooks (2 per shelf). Available in chrome finish and the following shelf lengths: 24", 30", 36", 42", 48", 60" and 72" (610,760,914,1066,1219,1524,1829mm). All units are 74" (1880mm) hi. For possible combinations, see the configuration page. For product specification sheet 10.01a, click here. Order additional Super Adjustable Shelves and "S" hooks separately. The load capacity (evenly distributed) for shelf lengths up to 48" is 800 lbs. (363kg) per shelf and for shelf lengths 60" and longer is 600 lbs. (272kg) per shelf.